EN David Adamovich from NYC was on US-TV again, featuring in the Guinness World Record show on January 27. His record there for "Most knives thrown around a human target in 1 minute" is a whopping 102! DE David Adamovich, der Messerwerfende Pfarrer aus New York, war mal wieder im US-Fernsehen. Bei der Sendung der "Guinness World Records" am 27. Januar war zu sehen, wie er dort seinen Weltrekord aufstellte: 102 Messer in 1 Minute um ein menschliches Ziel geworfen! FR David Adamovich, le lanceur prêtre de New York, avait un autre apparance au télé américain. Dans le show de "Guinness World Records" le 27 Janvier, on lui pouvait voir lancer 102 coutaux autour un cible humaine dans une minute, record mondial! EN The Gladiator Throwing Knife, made by show man Markus, has a quite fearsome style. He says it impresses the audience, sticks with a hefty "thud", and eats up targets fast. DE Das Gladiator-Wurfmesser, hergestellt von Show-Fachmann Markus, kommt ziemlich furchteinflößend daher. Aber Markus sagt es beeindrucke die Zuschauer, lande mit einem anständigen "Klack" im Holz und ruiniere die Ziele schnell. 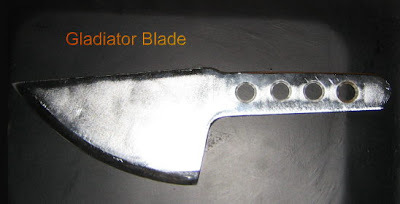 FR Le couteau de lancer "Gladiator", construit par montreur Markus, a l'air terriblement dangereus. Comme Markus dit, il impressione les spectateurs, fait un "clac" en arrivant dans la cible, et détruit les cible vite.